Who to Invite to the Stag Do? A big question that a lot of stags have when planning their last night as an eligible bachelor is ‘do I bring my dad?’ . It’s a question that the country’s top scientists have pondered over for decades and as of yet, none have been able to find a solid yes or no answer. Possibly because there isn’t one. We’d like you to take a minute to think about what kind of bloke your dad is and then compare it to what kind of stag do you’re after. Is your dad a jumper wearing birdwatcher who never misses an episode of countryfile? If so, we somehow doubt that a beer-guzzling contest followed by a strip show is really his scene. Call us crazy. It’s not rocket science folks. There’s just some places where your dad doesn’t belong. Ah, but that leaves a problem doesn’t it? The guilt. You feel compelled to bring your dad along even if it seems like a recipe for disaster. Well, look at it this way. If you don’t think your dad would enjoy the stag do then it’s probably kinder to just leave him out. At the end of the day, it’s your last night of freedom, not his and you should celebrate it how you want to. That being said, there’s nothing stopping you from keeping your friends stag do antics separate from his. While you and your friends enjoy whatever debauchery you want on the night, there’s nothing stopping you from taking him go-karting, paintballing or on many more stag do activities during the day. "...what's even riskier than inviting your dad to the stag do? Inviting hers..."
But you know what’s even riskier than inviting your dad to the stag do? Inviting hers. Dear God, if you really must do this you must treat it like an active minefield. Even if the stag do is entirely safe for work, all you need is a mate with a big mouth to blab about your exploits in Amsterdam and that’s it. Be very, very careful when approaching this one. You’ll be doing both of you a favour. When it comes to friends, sometimes you have to prioritise. If you can afford the money and space to bring 30 or more then have at it. But if you can’t afford that luxury then there’s no shame in saving spaces for your closest mates. If there’s any bickering or bad blood between someone, just politely explain how it is and if they can’t accept it, well, that’s their problem, not yours. So that’s our two cents on the issue. Do you have a different stance? 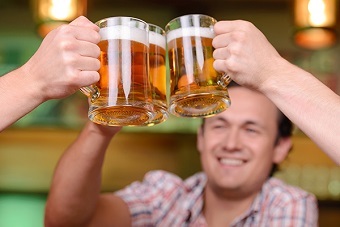 Leave a comment and tell us your ideas on how to deal with stag do guests!